Stacy Tilton Reviews: KIDZ BOP 27 Available Everywhere TODAY! 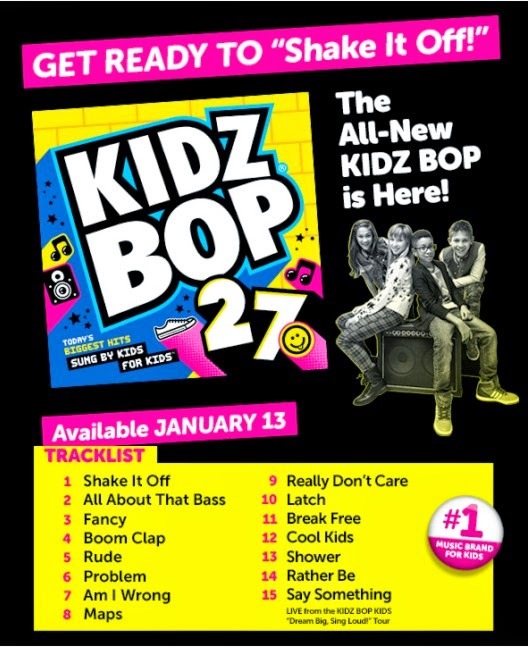 KIDZ BOP 27 Available Everywhere TODAY! If your pre-teen kids are like my daughter then they too are all about the KIDZ BOP CD's. I'm not sure if it's the actual songs that she likes more, or that the songs are sung by kids. Either way she loves singing along with them and I know I can rest assured there aren't any explicit lyrics being used. She can listen to popular songs of today and feel like she's "just like all the other kids" but with lyrics that aren't inappropriate for her age. And that's why this mommy likes the KIDZ BOP CD's. Buy it: KIZD BOP CD's are available at the KIDSBOPSHOP and on iTunes. Great cd for the kids since it does not have any bad words in it and it is also great for long car trips when traveling, my kids love singing along in the car.